Toro Rosso have unveiled their new car for 2009 but team boss Franz Tost admits a repeat of last year's race-winning success will be "difficult". Covers were taken off the STR4 on Monday at the Circuit de Catalunya near Barcelona, where the penultimate pre-season test sessions are taking place. The car is essentially the same as a Red Bull but has modifications which allow it to house a Ferrari V8 engine. Sebastien Bourdais and rookie Sebastien Buemi will compete for the Italians. Last year they produced a major upset when Germany's Sebastian Vettel won the team's home Grand Prix at Monza from pole position - its first ever Formula One victory - to become the sport's youngest race winner at the age of 21. Toro Rosso also scored 39 points - more than ever before - and finished sixth overall, one place ahead of sister team Red Bull. But Tost concedes that a repeat of that performance may be unlikely. "All race teams should have the same targets: to win every race they enter," he said. "Of course, this is not going to happen and even matching our 2008 showing will be difficult, as the sport enters a new era. "Therefore our target has to be to leave every race track on a Sunday night knowing we have done the best job we could." Germany's Vettel has subsequently moved on to Team Red Bull while Toro Rosso have employed the services of Buemi - the only new driver on the grid in 2009 - while retaining those of Bourdais. 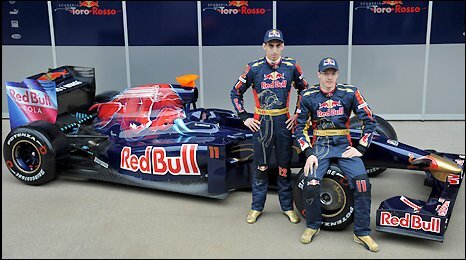 "In the end, when you sit in the car, it doesn't really matter if you're the only rookie or not," said Buemi, 20. "I will just try to concentrate as best as possible on my job, and that's it. I just need to relax and think about what I need to do, rather than the pressure of being the only rookie." Both drivers are now undertaking a four-day test programme in the car. "In 2008 our performance exceeded our expectations," added Tost, who has previously admitted that the car is ready quite late. "It's going to be tough to live up to that this year. "Within the team we can rely on a good level of stability, as all the key players on the technical side have been in place for some time now. "Further stability comes courtesy of the input of Red Bull Technology. From Red Bull Racing's first test in Jerez it appeared the chassis was competitive and that Adrian Newey and his team had come up with a very promising package." Bourdais drives in testing on Monday and Tuesday before handing over to Buemi for the final two days.